Special to Tribune Chronicle / Robert Hayes Michael Akuchie of Youngstown State dunks in the Penguins’ win Saturday. YOUNGSTOWN — The play was one of many in the first half and came as Youngstown State was making a run after an early deficit to Green Bay, leading by 10 at the time. Green Bay missed a jumper from about four feet away. It was rebounded by Naz Bohannon, one of nine rebounds he had on Saturday. He almost had a double-double with nine points and nine rebounds in the Penguins’ 96-77 victory. 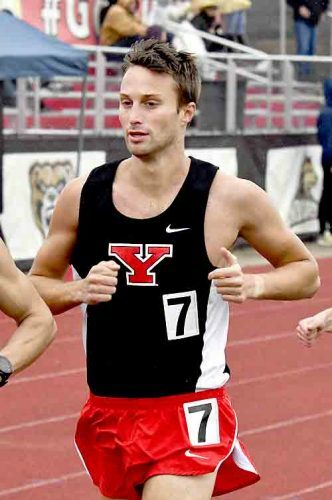 The transition came quickly as YSU coach Jerrod Calhoun, as he does most times from in front of his bench, waves his team to speed up the game’s tempo. The pass was made to Donel Cathcart III who was running untouched on the left wing, quickly making his way toward the basket. He converted, but was knocked to the floor. No foul was called, but he was down. Calhoun made a beeline toward Cathcart like a concerned parent. Calhoun looked him over for a quick minute and helped up his 6-foot-5 wing from Buffalo. The two bumped fists as they walked toward the YSU bench as play was stopped. 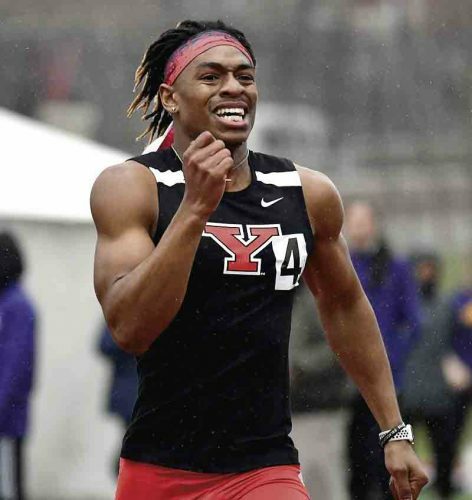 Special to Tribune Chronicle / Robert Hayes Darius Quisenberry drives the lane for YSU Saturday against Green Bay. It was part of the resilient nature the Penguins have displayed during their recent four-game win streak. 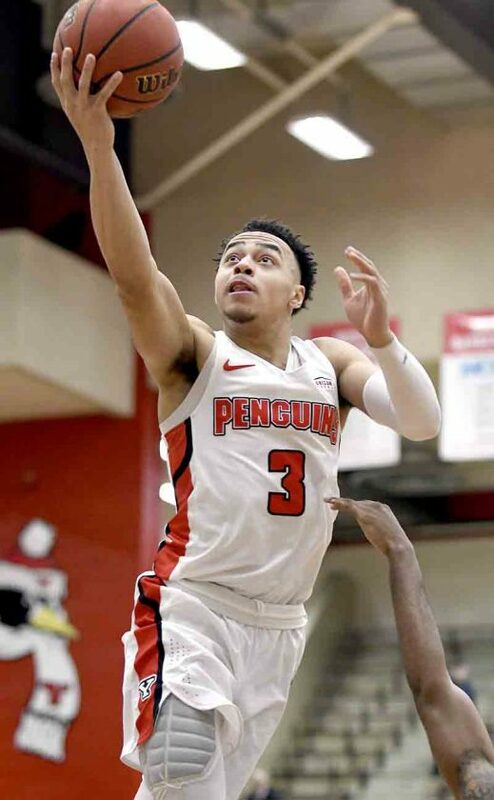 The Penguins (10-16, 6-7 Horizon League) were leading 30-20 when Cathcart went down, coming back from an early 8-0 deficit when Green Bay (12-13, 6-6) made two straight 3-pointers to start the game. At that point, Calhoun called a quick timeout and regrouped his team. YSU started 0-of-5 from the floor. “I think it takes two or three minutes, for whatever reason, to figure out how fast they’re playing,” Calhoun said of Green Bay. “You can show it on tape and you can do it in practice, but them guys fly. We left them wide open. 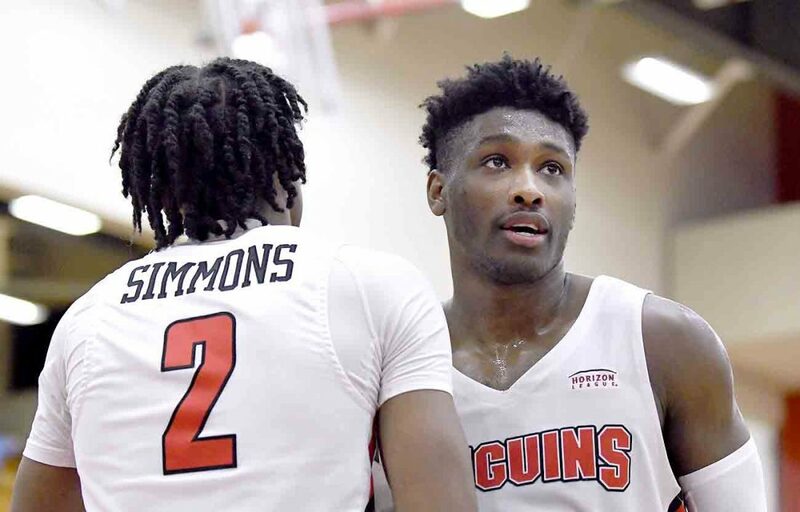 Special to Tribune Chronicle / Robert Hayes Jelani Simmons, left, and Garrett Covington congratulate each other after YSU's win Saturday over Green Bay. Things spiraled out of control for a Phoenix team which had won two straight coming into this game. This is a Green Bay team which holds a 34-11 advantage in the series dating back to 1993, but the Penguins won their second straight over the Phoenix at the Beeghly Center. 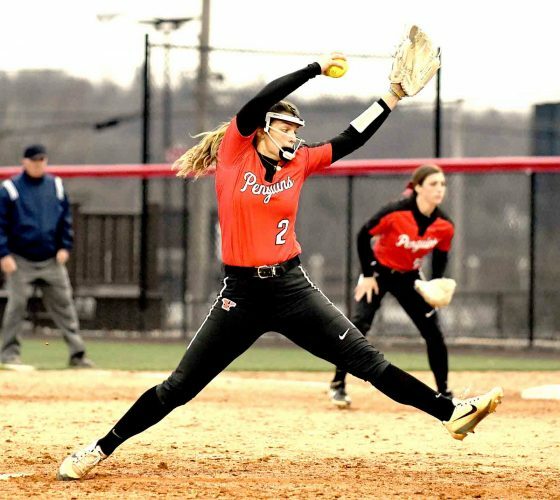 The Penguins started Saturday in eighth place in the 10-team league and are still there despite the win, but they are a half game out of three-way tie for fifth with IUPUI, Green Bay and Detroit Mercy. Only two games separated third-place Oakland and eighth-place YSU before Saturday’s games in one of the most tightly-contested mid-major, or for that fact, any league in the country. This year the Horizon League postseason tournament is limited to the top eight teams. The top four teams after the regular season host first-round games. YSU is currently a game out of fourth place, where Oakland resides. UIC is a game-and-a-half away from the Penguins in third. “We got a chance,” Calhoun said. “Being young, people are going to tell us how good we are, winning streak and all that. Kids got to have swagger, got to have confidence. Things are coming together on offense, shooting 21-of-32 in the first half and 37-of-66 for the game. YSU held Green Bay to 10-of-27 in the first half and 24-of-58 for the game. YSU ran roughshod on the Phoenix for most of the game, seeing the tired faces on the Green Bay players. It was as close as Calhoun has seen to the up-tempo, Press Virginia (based on West Virginia’s pressure-style game) in the two years he’s been YSU’s coach. Green Bay’s Jayquan McCloud misfired on a 3 with less than 17 minutes remaining. Noe Anabir grabbed the rebound as YSU quickly set up its offense again. The ball was passed to a wide-open Cathcart left so alone it seemed as if he had about a minute unguarded in front of the YSU bench. He promptly canned the 3 for a 65-38 lead. ShanQuan Hemphill and Sandy Cohen III each had 14 points to lead the Phoenix. “We won the last four games because we’re playing really good defense and we’re taking care of the ball,” Calhoun said. 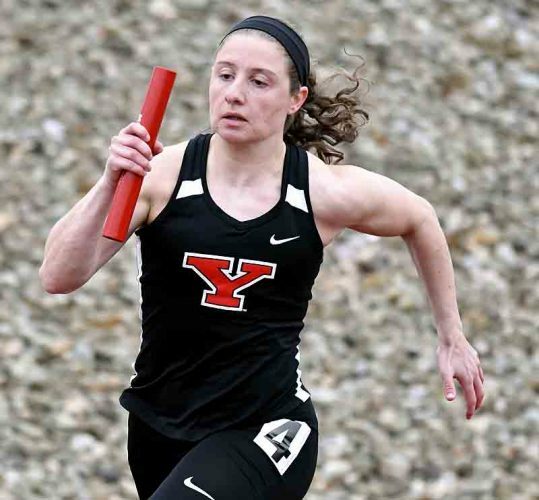 YSU’s success was because of hard work. Sophomore wing Garrett Covington had 16 of his 18 points in the first half to lead the Penguins’ first 20 minutes of success. “It was so awesome to see Garrett Covington,” Calhoun said. “He was the first one in the gym this morning when I got here. He was with the first group of guys. 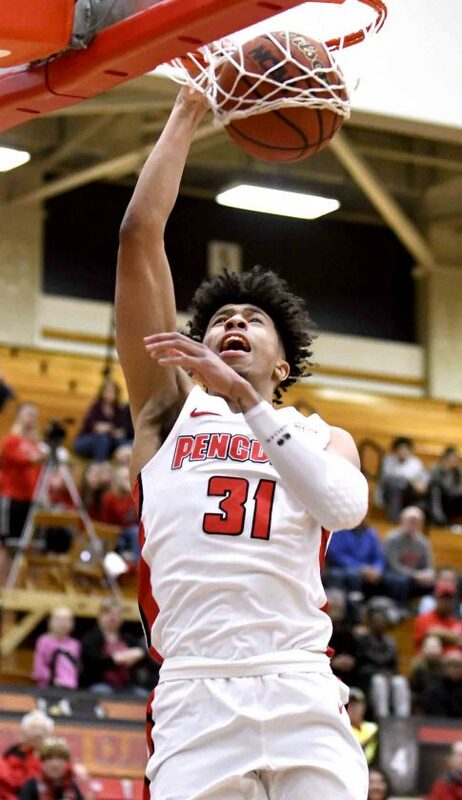 Jeliani Simmons, Noe Anabir and Devin Morgan each added 10 for YSU, a team Calhoun hopes more than 2,170 people in the Beeghly Center will see as the Penguins host UIC Thursday and IUPUI on Saturday. The Beeghly Center holds 6,500 people. The last time YSU had more than 6,000 for a game was 6,313 against Cleveland State on Jan. 28, 2012.